If you intend to live and work in Amsterdam or anywhere else in the Netherlands then it is absolutely essential that you have a local Dutch bank account. Generally, bank accounts can be opened once you have an income in place. To open a standard bank account you need to personally visit a branch, preferably near to where you live or work. New mobile banks can be opened online. Identity Document – This should be a valid passport; a valid Dutch driving license or identity cards from certain EU countries may also be accepted. If you have a residence permit card you should also bring this. BSN number – When you register in the Netherlands you will receive a Burger Service Nummer (citizen service number). This is used as both a fiscal number for dealing with the tax authorities and also as a general identifier for government services and healthcare. You will need to provide the bank this number. Proof of Income – The bank will require some evidence of income in the form of an employment contract, recent pay slips or a statement of employment benefits. Without any income you will probably not be allowed to open a current account. Students should bring proof of enrollment at their university or educational institution. Also see How much money will I earn in the Netherlands? Proof of Address – The bank may sometimes ask for proof of address such as a rental contract for your house/apartment or a recent utility bill. In our experience opening a bank account in the Netherlands can sometimes be a hit and miss affair, especially if you don’t yet have everything in place. It really depends on the member of staff – you may get to experience the “dat kan niet” (“that’s not allowed”) attitude prevalent amongst a few Dutch service personnel! If you do hit a brick wall then it’s best to try another branch or another bank. Hopefully you will find someone who can show flexibility in getting your account sorted. The following is a summary of the main Dutch banking options. The big 3 (ABN Amro, ING and Rabobank) have significant market share; online upstart KNAB has recently shaken-up the scene whilst ASN and Triodos brand themselves as ethical banks. ABN AMRO (abnamro.nl) – The popular Dutch banking giant has branches all over the country. ABN AMRO has a special international clients division so it is well used to dealing with expats, particularly in the main city branches. It offers internationals a full range of financial services such as bank accounts, insurance, investments and mortgages. In addition it also offers current accounts and insurance packages for international students in the Netherlands; it also has a specialist desk for dealing with international high flyers in the sport and entertainment fields. ABN AMRO has an extensive English version of its website, internet banking portal and mobile banking app. It can provide correspondence and documentation in English where possible, although legal agreements will usually be in Dutch. For those on higher incomes (at least €5,000 per month or a minimum €50,000 balance) there is Preferred Banking status – this gives a more personal service and the use of a third-party lounge at Schiphol Airport when flying to non-Schengen destinations. 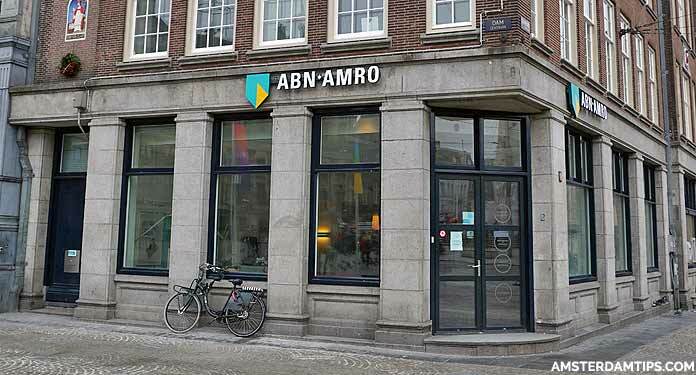 As a side note, the name ABN AMRO originates from 2 Dutch banks which merged in 1991 – ABN bank (Algemene Bank Nederland) and AMRO bank (Amsterdam and Rotterdam Bank). ABN AMRO was purchased by a consortium of Royal Bank of Scotland / Santander / Fortis in 2007. Following the financial crisis, the bank was nationalised in 2009 by the Dutch government along with Fortis Nederland. In 2015 it was partly relisted on the Dutch stock exchange, with the government planning to slowly reduce its shareholding over the coming years. 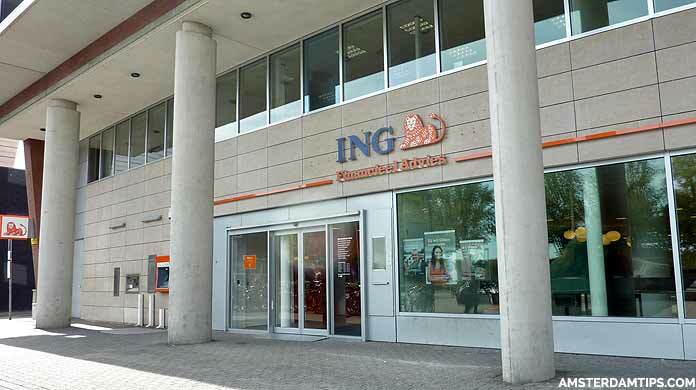 ING (ing.nl) – Internationale Nederlanden Groep is a major international banking, insurance and asset management group. It became the largest Dutch retail bank after taking over the old Post Office bank Postbank which was re-branded as ING. As long as you satisfy requirements, ING claims it can open an account in branch within 20 minutes, without the need of an appointment. ING offers an English version of its mobile banking app; whilst its online banking portal is in Dutch, it offers detailed documentation in 6 languages (English, Polish, Spanish, German, Turkish and Arabic) on how to use it. Rabobank (rabobank.nl) – Privately owned Dutch bank and financial services group with roots in agricultural and cooperative finance. In terms of the big 3 Dutch retail banks, it is the second largest bank by assets and has higher safety ratings from the international agencies. Rabo has many branches in Amsterdam and all over the Netherlands – unfortunately, it does not have any English language available on its website or internet/mobile banking. To set up an account with Rabobank you should visit one of their main city branches. SNS Bank (snsbank.nl) – SNS stands for Samenwerkende Nederlandse Spaarbanken (Co-operative Dutch Savings banks). Since 2017, this Dutch retail bank has been part of De Volksbank group which is owned by the Dutch state following a nationalisation of SNS in 2013. SNS Bank has about 200 branches in the Netherlands, with 2 in central Amsterdam – at Bilderdijkstraat 50 and Ceintuurbaan 334. It has automatic teller machines (ATMs) located in HEMA stores. SNS provides banking and financial services to retail customers with all its online and banking services being in Dutch. However, an interesting option to some international clients is the SNS EU Betaalrekening account. This is only available to those over 18 who do not have a BSN number or Dutch address but have the right to live in the EU and have some sort of connection to the Netherlands. ASN Bank (asnbank.nl) – A small Dutch online bank (also part of De Volksbank group) headquartered in The Hague and focussed on ethical banking and sustainable investments. ASN offers interest on its current account. The bank is branchless so accounts can only be applied for online – you also need to post a copy of your identity document. No English language info or products are available. ASN requires that you already have a Dutch bank account, so this not an option for arriving expats. Triodos Bank (triodos.nl) – Also a small ethical Dutch bank which offers an online current account and other financial products. As with ASN, accounts can be applied for online and documents need to be posted – it takes around one week to set up an account. Triodos has no branches but does have an office in Zeist (near Utrecht). There are no English products available for Dutch-based clients though Triodos does have an English website for the UK market. KNAB (knab.nl) – An online bank set up in 2012 by financial group Aegon. Account packages start at €5 per month. KNAB offers slightly higher savings interest rates compared to other Dutch banks – however these are only available to package holders. It also provides other financial services such as investments, crowdfunding and mortgages. The online portal is only available in Dutch. Van Lanschot (vanlanschot.nl) – The oldest independent bank in Netherlands which dates back to 1737. It offers current accounts and other financial services and has a particular focus on entrepreneurs, professionals and high net-worth individuals. It has no English info on its main website. Headquareted in ‘s-Hertogenbosch, it has a single branch in many Dutch cities including Amsterdam at Apollolaan 150. For non-Dutch speaking internationals setting up in the Netherlands, probably the best banking bet is ABN Amro followed by ING. For those who can speak Dutch or have Dutch friends or partners to assist, then you have more choice. However, new mobile banks can offer expats an easier route to opening an account. Mobile banks are becoming ever popular with the younger generation and offer easy-to-open accounts and a raft of app-based features. bunq (bunq.com) – A modern app-based Dutch bank (launched in 2015) with international portal available in English, Dutch, French, German, Italian and Spanish – making it a smart choice for expats. Offers Premium, Joint and Business accounts from €7.99 to €9.99 per month. Opening a bunq account by phone app can be done quickly as long as you have ID at hand and a European address. You get interest paid on balances up to €10,000, a Maestro/Mastercard debit card which has zero foreign exchange fees and low-fee international transfers with TransferWise. The app has push notifications on transactions and makes it easy to set budgets and open joint accounts if sharing expenses. bunq also allows users to choose how their deposits are held and invested. N26 (n26.com) – Another app-based bank based in Germany which offers mobile banking throughout Europe. The standard N26 account is free, a premium N26 Black account costs €9.90 per month. Account holders are issued with a Mastercard debit card. The Black account offers fee-free withdrawals worldwide and Allianz travel insurance coverage. The standard account allows 5 free monthly withdrawals in euros per month, non-euro transactions have a 1.7% fee. Any transactions on the card comes through as push notifications on the app. Support is available in English, French, German, Italian and Spanish. Once your current account (betaalrekening) is confirmed you will get an international bank account number (IBAN) code which has 18 characters in the Netherlands. Each bank also has a special BIC identifier code, for example ABNANL2A for ABN Amro. You will shortly receive a local debit card (betaalpas or more commonly known as PIN pas) which can be used to withdraw cash at ATMs (geldautomaat) and make chip and pin or contactless payments at retailers. The card is either Maestro or V-Pay branded as the old Dutch PIN branding has been phased out. Contactless payments can be made for small transactions under €25. The card also allows international transactions – Euro currency withdrawals in the eurozone are generally free but you will be charged for foreign currency (non-euro) transactions. Expect a monthly charge for running a current account and debit card – this will range from about €1.30 to €7 per month, depending on additional services included in your banking package. Credit cards in the Netherlands are slowly becoming more accepted though a number of Dutch retailers still won’t accept them. Dutch internet banking and mobile banking are popular and can be easily set up with your account. Most banks will send you a special card reader or scanner for use when logging in and/or making online transactions. An online payment system called iDeal is used by many Dutch online retailers which links securely to your internet banking portal to make direct payments without charge. Note that due to issues with international fraud, Dutch banks default the debit cards for use only within Europe. You must (temporarily) set it to “worldwide use” using internet/mobile banking if you want to make withdrawals outside Europe. You can also change the maximum daily withdrawal amount which is generally set at either €250 or €500 per day. Bills in the Netherlands are generally paid either by direct debit or online bank transfer. Many transfers are made using the acceptgiro system where the payment has a special reference number. This used to be done by filling in a yellow slip of paper (attached to the invoice) and sent back to the bank – however the majority of acceptgiro payments are made online. Note, standard cheques are not used in the Netherlands – if you deposit a cheque into your account (even if denominated in euros) you will likely be charged a hefty €15-€20 for the privilege. Once your main current account is set up, you can easily open a savings accounts (sparen), although interest rates in the Netherlands and Euro area are currently very low. You will find slightly higher interest savings rates on offer from either smaller banks or foreign banks. For example, NIBC Direct (Netherlands), Argenta (Belgium), Garanti Bank (Turkey) and Anadolu Bank (Turkey) all beat the savings interest rates from the main Dutch banks. Investment accounts (beleggen) can also be set up at most banks or by using a specialist broker such as Binck. Ethical investment products are available with ASN and Triodos Bank – some of which are exempt from Dutch wealth tax. Note, Dutch bank deposits are officially “guaranteed” up to €100,000 by the Dutch central bank. A temporary 3 month guarantee up to €500,000 is given for proceeds of a house sale. If you have more than €100,000 in savings then at least spread it around different banks or consider other international diversification strategies.